Following a Humane Society of the United States petition, federal officials have decided to revoke the authorization for Oregon and Washington to kill sea lions eating endangered salmon at the Bonneville Dam on the Columbia River. The Humane Society said the decision means the two states cannot kill any of the federally protected sea lions unless NOAA fisheries approves a new request. Since 2008, Oregon and Washington have killed dozens of sea lions that feed on salmon migrating upriver to spawn in the spring as they hit the bottleneck of fish ladders over Bonneville Dam on the Columbia River east of Portland, bendbulletin.com reported Wednesday. "We're delighted the agency has changed its mind and revoked the State's authorization to kill hundreds of native sea lions for having the audacity to eat fish for dinner," Jonathan R. Lovvorn, senior vice president and chief counsel for animal protection litigation for The Humane Society said, in a statement. 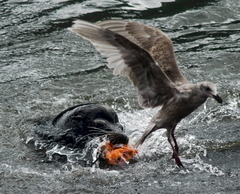 "It's time to face the fact that killing sea lions doesn't do anything for salmon, and focus instead on real salmon conservation threats, like hydropower and commercial fishing."